A waste of time, a load of rubbish? The scientific side of what’s in our bins is to be unearthed during ‘rubbish’ live science shows in Dundee. From plastic bottles to electric bits and bobs, Dundee Science Centre is inviting visitors to burrow in the bins, rifle with rubbish and tinker with trash as part of ‘Scrapyard Science’. Grant Carpenter, Exhibition and Community Engagement Officer. Credit: The Courier. With the chance to create cool stuff out of everyday items, the interactive, family activities will reveal the ingenious world of engineering and the fun results of recycling. Events will run from Saturday 30 September through to Sunday 31 December 2017. 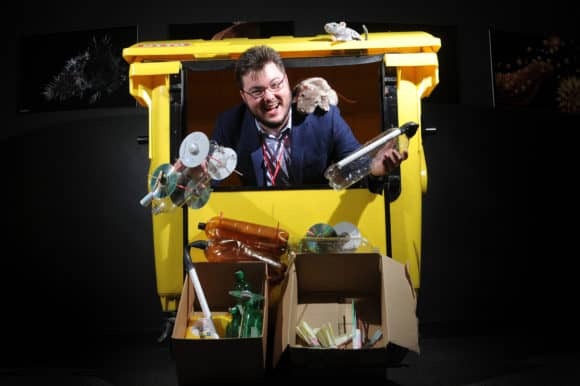 Grant Carpenter, Exhibition and Community Engagement Officer said, “It’s very easy to chuck things in the bin but, with such a global effort to reduce waste, there’s plenty fun to be had from what we might otherwise throw away. The shows will run regularly throughout the day, with events included as part of normal admission to Dundee Science Centre.